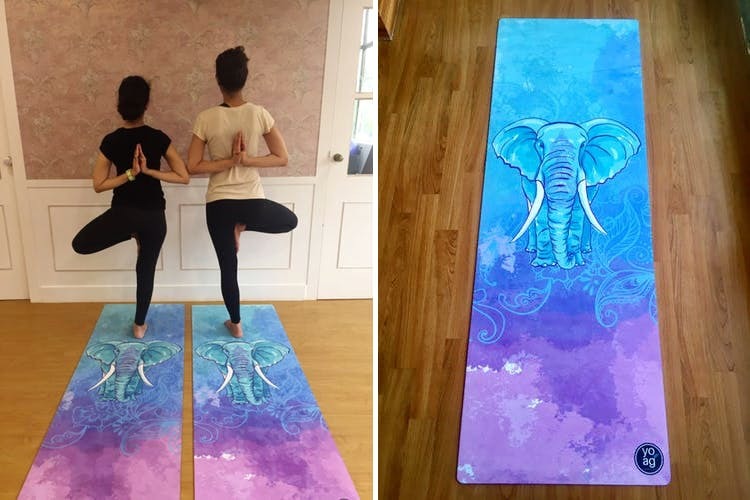 Yoga enthusiasts, this brand doing organic, beautifully designed mats. Yoga Essentials is winning for their recyclable mats made with organic material. For those of you who are environmentally conscious and do your bit to make sure that you're living a sustainable life, these mats by Yoga Essentials are perfect for you. Made using natural tree rubber, they're free from harmful chemicals and plastic that's found in PVC mats. The best part? They're biodegradable and recyclable.Besides being environment-friendly, they come in the most beautiful designs. Each piece is unique but they all look so colourful and graphic, it's like doing yoga on a water painting. Our favourite design's got to be this vibrant elephant one, merging from blue to turquoise to lilac to a deep purple. It's an eclectic mix of colours and we're definitely using it for our yoga lessons. The towel-like microfibre suede surface is non-slip and designed to absorb sweat, so you won't slip and you can also send your mat for a wash later. It's sweat absorbing properties make it perfect for all kinds of exercise, so you can share it with someone else in your house who does pilates or needs a mat for fitness exercises.